I am mum to four grown up children, two granddaughters, and 2 grandsons. I have always loved being a mum, and had good pregnancies and Birth experiences. I live in the Berkshire, countryside, near Newbury with my husband of 38 years. I enjoy wildlife, photography, and looking after my four grandchildren. I travel up to roughly 1.5 hour from my Berkshire home to support my client, at their choice of birth place. I believe that every woman and couple, deserve to make informed choices about their pregnancy and birth, and support is crucial. I feel that a very important part of my support is sharing information and my experience for them to be confident to do so. 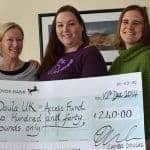 I decided to become a Doula after supporting my daughter whilst in labour and birth of her daughter, in hospital. I have always had a passionate interest in pregnancy, labour, babies and children, and believe that ‘mothering the mother’ could be my role, giving support, and encouragement antenatally, during labour and delivery, and postnatally. Empowering women to make informed choices about their pregnancy and Birth is very important to me, and I believe plays a crucial role in enabling women to have the birth that they long for. Choices can be made however a woman chooses to give birth, and I have signposted mums to be who are having Caesarean sections to information to enable them to plan a ‘gentle’ C section. Wherever or however you decide to give birth, I will be beside you all the way. I have attended Hypnobirthing courses with clients and supported several women using hypnobirthing. Shortly after my training course, with Nurturing Birth, I was privileged to be asked to be at the birth of a friends second baby, which was a home water birth, with two independent midwives and a very experienced Doula. It was an amazing experience, and it was wonderful to see a beautiful 10lb 6oz baby boy born with hardly any pain relief and no intervention, due to the knowledge of the incredible midwives, and the support of a fantastic Doula.It really made me realise how empowering childbirth is, and how with the support of good people and the right environment, how positive it can be. I have attended many births as a Doula, both home birth and hospital births. I also have some experience of premature labour. I have knowledge of hypnobirthing, having attended classes with clients. I am available for occasional night nannying with babies.